Domestic has a number of definitions. It can mean relating to home, household or family. It can also mean something produced or manufactured in one’s own country. Both definitions can be applied to Domestic, a restaurant in Shepherdstown, West Virginia. Burgers have always been a particular popular bit of American fare. Of course, they’re on the menu, but Vaira adds creative twists to that dish. Rise and Shine, for example, consists of the burger, an over-easy egg, bacon, white cheddar cheese and garlic aioli. Then there’s Glazed and Confused where the burger is served on a glazed donut bun, along with bacon and sriracha aioli, a hot sauce containing eggs, garlic, oil, lemon juice and spices. Vaira lists two entrees offered as the most popular ones. They include blackened catfish served with cheddar grits, tomato gravy, and balsamic brussel sprouts. The other dish is pan-seared crab cakes with green goddess sauce, which contains mayonnaise, sour cream, chervil, chives, anchovy, tarragon, lemon juice and pepper, along with shaved butternut squash and carrot salad and hand-cut fries. “People also like our tot-chos. It’s a tater tot with a difference,” Vaira says. The loaded tot-cho is a tater tot dipped in queso, salsa with beer-pickled jalapenos. Other appetizers include bacon-wrapped scallops and crispy fried green beans. A wide variety of sandwiches are included on the menu, like the Reuben: corned beef, sauerkraut and thousand island dressing; fish and chips; the clubber: grilled turkey breasts, bacon, tomato, red cabbage slaw and garlic aioli; a variation on the Sloppy Joe called Sloppy Jose: ground beef, cumin, jalapeno, tomato and white cheddar; and something called the not-so-philly cheesesteak: shredded white cheddar, chipotle aioli, diced jalapenos, roasted red peppers and caramelized onion. Vegetarian and vegan dishes are also on the menu. “We cater to carnivores and others,” Vaira says. 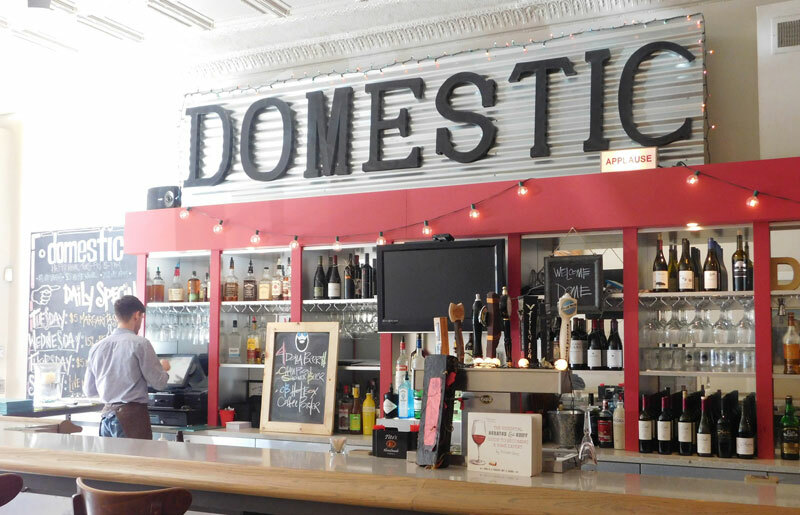 Domestic even has a brunch menu with such items as French toast, biscuits and sausage gravy and sausage biscuit quiche with red pepper, purple onion, white cheddar, chilis and mesclun salad, a mix of assorted salad greens. Snack and share items include southern pan-fried grit cakes, fried pickles and beer-battered onion rings. Under the heading land and plant, Domestic offers Asian grilled chicken salad: romaine lettuce, bacon, red chiles, green onions and creamy miso ranch dressing; and honey-garlic chicken: brussel sprouts, shaved carrot, soy and basmati rice. In order to give the place a more domestic, homey feel, all meals are affordable and less than $20. The restaurant can seat about 75 people with a bar that has room for 10 to 12. Domestic has ten part-time employees. “I really want people to feel like this is a community meeting place,” Vaira says. With that thought in mind, Domestic hosts numerous events during the week for all kinds of tastes. “The first Sunday of the month we have a poetry reading. Poets find a very accepting audience here. There is always something going on. Tuesday night is blue grass jam; Wednesday is open mic; Thursday is jazz jam. Friday night people can do stand-up comedy. Saturday the entertainment is kind of random and Sunday is jazz. All of this creates great energy for Domestic. We want to please people. Make them happy. Get them to have a good time,” Vaira says. Domestic is also available for private events and parties. The establishment does a little catering, too. Casual is the operative word for Vaira. He adds that casual dining has definitely become more and more popular over the years. Even refreshments at Domestic have a casual theme. Water and other drinks are served in mason jars. However, casual is not the attitude Vaira takes concerning his livelihood. Originally born and raised in Pittsburgh, Pa., Vaira started out with plans to be a journalistic. He received his English degree from West Virginia University. He headed west to Denver, Colorado, then returned to live in Charles Town, West Virginia, for the next 20 years. “Charles Town was going through some redevelopment. It looked like a good place to be,” Vaira said. He ran Dish restaurant in Charles Town for eight years, closing that establishment three years ago. He opened Domestic in 2013. He became a chef almost out of necessity. “I always had a passion for food and cooking. Read a lot of cook books. I kept finding myself doing more and more in the kitchen over the years. I finally stepped into the role of chef. You really have to want to work and be focused and consistent,” Vaira says. Finding your own niche to get customers to come in can be another challenge, Vaira says. “People don’t walk around town to shop as much as they used to because they can order things online. That’s happening everywhere. You have to create a following. Shepherdstown also gets a lot of tourists. That helps,” Vaira says. Still, it’s that attachment to the local community that really is important to Vaira. “We have a group of older gentlemen who regularly meet here, eat and solve the world’s problems,” Vaira says, smiling. 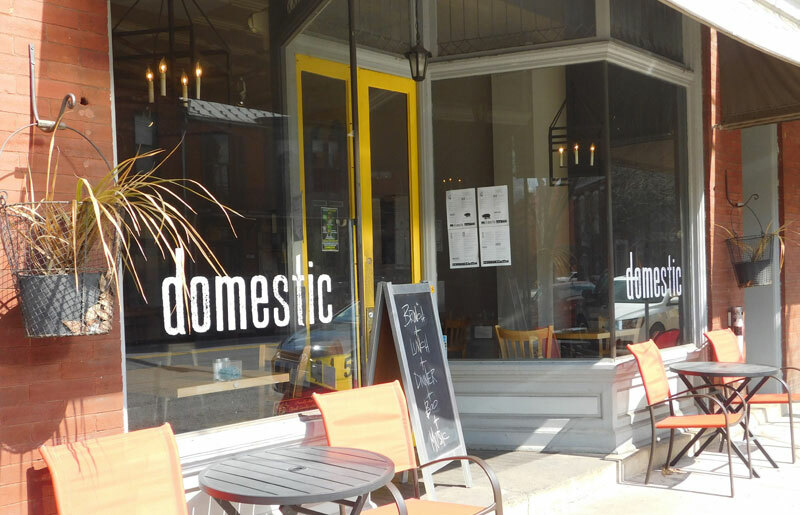 Domestic is located at 117 East German St. Its hours are Tuesday, 11:30 a.m. to 1 a.m.; Wednesday, Thursday, Friday, Saturday 11:30 a.m. to midnight; and Sunday 11 a.m. to 9 p.m. Domestic is closed Monday. For more information, go to the website at www.wvdomestic.com.